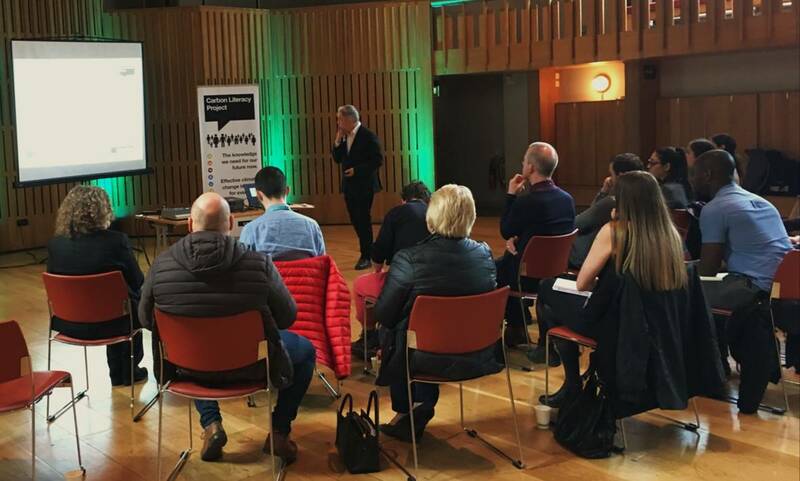 On Friday 5th April, Leeds Climate Commission* and Opera North hosted a Carbon Literacy in Leeds event, bringing together representatives from a range of Leeds-based organisations who are keen to champion the development of Carbon Literacy across the city. This event came at a fitting time where a week prior, Leeds City Council passed a motion to declare a climate emergency in the city including a pledge to achieve carbon neutrality by 2030. The morning was organised by Leeds Climate Commission’s Communications and Engagement Officer, Kathryn Lock with presentations from Phil Korbel (Co-Founder and Director of Advocacy, The Carbon Literacy Project), Phil Holdgate (Project Manager, ITV Studios), and Jamie Saye (Senior Technician, Opera North). Representatives from – Leeds City Council, Kirkstall Valley Development Trust, Sycous, University of Leeds, NHS Digital, CoE Diocese of Leeds, Yorkshire Water, Sir Robert McAlpine, and Harewood Estate – attended the event, all with different knowledge and experience of Carbon Literacy and climate change, but unified in their ambitions to roll out training in their organisations and throughout the city. Kathryn started off the morning by discussing the importance of achieving a zero carbon Leeds by 2030, making the most of the opportunities to reduce emissions such as the £270,000 a year savings potential in the city, as well as the co-benefits around health and happiness. Phil Korbel provided a brief summary about The Carbon Literacy Project, how The Project’s ambitions tie into existing goals and strategies for Leeds, and the importance of collaboration and engagement in creating a low carbon culture in the city. Phil Holdgate then shared his experience of Carbon Literacy describing how he went from stumbling across sustainability whilst looking at cost-savings measures within his organisation, to becoming a self-declared CL super-fan! Carbon Literacy training has become the production and broadcast industry standard through the BAFTA project ‘Albert,’ and its rollout at has been a huge success within ITV, recently awarded as a Silver CLO. Phil aspires to get CL into the every-day so it’s business as usual and a part of the culture at ITV. The Yorkshire soap Emmerdale is aiming for 100% of their staff to be certified as Carbon Literate by the end of the year, with the same ambition for ITV over a longer timescale. Jamie Saye from Opera North (a national opera company based in Leeds), then went on to talk about the role arts and cultural organisations have in embedding Carbon Literacy within their industries. This led to the creation of ‘SAIL’- Sustainable Arts in Leeds. Similar to MAST, (Manchester Arts Sustainability Team) SAIL aspires to be a consortium to share best practice and resources within the cultural and arts industries in Leeds. Opera North has already made strides in reducing their carbon emissions, replacing their production/stage lights with LED’s, procuring 100% renewable energy where possible, as well as announcing a £15 million building project which will include the installation of onsite solar PV. Following the presentations, Carbon Literacy volunteer Natalia Phipps then led a taster activity called ‘Spheres of Influence’. The activity encouraged the audience to examine areas of their lives where they felt they had the most power to reduce their carbon emissions, whether it was at work, home or socially. After some group discussion and brainstorming, a wide variety of actions were proposed including inspiring students when teaching, installing LED lighting, and committing to communicating sustainability to senior management. The groups then discussed barriers to implementing these actions, and how they could overcome them. This enabled those who hadn’t come across Carbon Literacy before to get a feel for the sort of activities that could be included in a course, and what that course might look like for their organisation. An open discussion about how Carbon Literacy can be disseminated further in Leeds to help enable the city’s transition to zero carbon and how this aligned with the Leeds Climate Commission’s targets and ambitions wrapped up the morning. Questions and queries were encouraged and next steps for the attendees to roll out training in their own organisations were discussed. The morning was an inspiring start to what we hope will be the beginning of a city-wide roll-out of Carbon Literacy in proportion to the scale of the challenge and ambition within Leeds. Achieving carbon neutrality by 2030 in Leeds will be by no means an easy feat, but with the help of aspiring individuals, such as those present at this event, rolling out Carbon Literacy throughout the city would make a meaningful contribution to bringing everyone along with the plans and working towards them as a collective. For any organisations that couldn’t make it to this event, but are interested in Carbon Literacy, head to the Organisation section of our website to find out how you can get started. *Established in 2017, The Leeds Climate Commission seeks to be an independent voice in the city, providing advice on transitioning to a low carbon, climate resilient future, to inform policies and shape the actions of local stakeholders and decision makers. It brings together key organisations and actors from across the city, from the public, private and third sectors, fostering collaboration on projects that result in measurable contributions towards meeting the city’s climate reduction targets.